Designed by Annelise Pitt, owner of Thistledown Cozies. 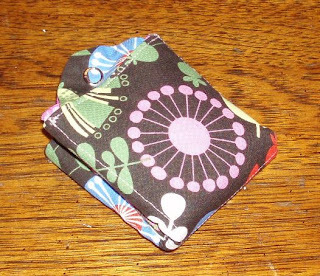 If you wish to buy Ms. Pitt’s tea wallets and other tea accessories, you may purchase them at the Thistledown Cozies website. 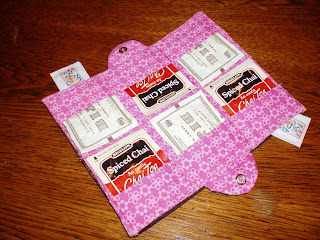 Okay, ya’ll, here’s my tutorial for making this tea wallet. I’m sure this is not the only way or most efficient way to make this cute little craft; it’s just what I devised at this time. This tea wallet contains six inner pockets for packaged tea bags and four extra pockets for sweeteners. It took me a little over two hours to draft the pattern, cut out the fabric and interfacing, and actually sew the wallet. I hope you enjoy making your own! EDIT, 2/3/2009: I see many people are being directed to this blog post to check out my tea wallet. I haven’t had time to update the tutorial, so I’ll just post some edits to the construction here. 1. For the last two wallets I made, I ONLY interfaced the tab closures. My rationale for this is because the tea packages create bulk, so all that other interfacing really is not needed. 2. I redrafted the inner and outer panels to 9-1/2″ x 7-1/4″ and cut one of each on the fold. That way you are sewing three sides instead of four, and this decreases the bulk. 3. I redrafted the pockets to 9-1/2″ x 3-1/2″ and cut two (to be folded in half later). I thought this was easier than cutting two on the fold. 4. For the tab closure, I made it 2-1/2″ high x 3-1/2″ wide (diameter). It’s a little taller than a half circle, but it enables you to comfortably place the snaps and close the tea wallet. 5. When placing the pockets on the inner panel, sew across the bottom edges first. Then when you are ready to sew the inner and outer panels together, sew through all the thickness at three-inch intervals. This will keep you from sewing over previous stitching, like I originally instructed. Please leave me your commments or questions. Muy buena idea… Saludos desde España ! This is Annelise Pitt, owner of Thistledown Cozies. I am the designer of this tea wallet. I don’t patent my designs ( can’t afford to – have a rant on that but this is not the forum for that), but would like to be recognized for this very cute and useful item. Great idea for that little something extra in a gift basket. With Mother’s Day coming up, there is plenty of time to make several of these for Mom, Granny, or that special friend. Thanks for sharing this tutorial! What a fun gift for the tea lover! Thank you. I hope it is ok…. I posted one pic of this on my blog and directed them here for the tutorial. Hopefully it will give you more exposure also! 🙂 Thank you for this great gift idea. Great idea for my secret sister! thank-you so much for posting this, i absolutely love this idea! this is a fantastic idea for my office! Hey girl, I love this idea! You are so very talented! Finally got a blog going myself- thought what the heck, it could be fun. See you soon for some tea! I am glad I found your blog!! Please feel welcome to stop by my blog…it’s an issues blog so we get some deeeep conversations….right now there are several conversations happening….some transwomen have stopped by to share in the discussion about transgendered women…we’re discussing celibacy…we’re also discussing phobias…so jump right in whenever you’d like! thank you for this. this is perfect for traveling because i always hate the tea in the hotel rooms! That is too cool! Thanks for sharing that!! Thanks, Krystal. I’m a tea drinker too. 😉 This is a great project.